The Danes have a great deal to be proud of. They’re the World’s Happiest People. They have a high level of social cohesion, equality, and standard of living. They have some of the best restaurants in the world. They thumbed their nose at their Nazi occupiers during World War II, and saved their small Jewish population in the process. They have the World’s longest running monarchy, and the oldest flag. And yet, despite their rich cultural history, their most recent and noticeable contribution is a simple children’s toy: Lego. The company, which takes its name from the Danish phrase leg godt, or “play well,” started off with wooden blocks, before moving to the now-famous plastic interlocking blocks in the late 1940s. Since then, millions of children have played well, and approximately half-a-trillion plastic pieces have found their way to toy shelves and under parents’ feet worldwide. My parents will happily tell you about my lifelong love of Legos. Long before I knew what or where Denmark was, I was eagerly opening new Lego sets, carefully and faithfully following the instructions inside, and occasionally complaining that a certain a key piece was missing from the box (although a more thorough, careful search with the help of Mom or Dad always revealed the overlooked piece). One of my most prized possessions was a large, red, plastic Lego box, containing a loose assortment of every size and shape block I could possibly ever want or need. I would spend hours building and rebuilding houses, football stadiums, or racetracks, among innumerable other things. This love has never left me. To this day, I have to fight back the temptation to buy new Lego sets and make our whole apartment into a mini Lego village. 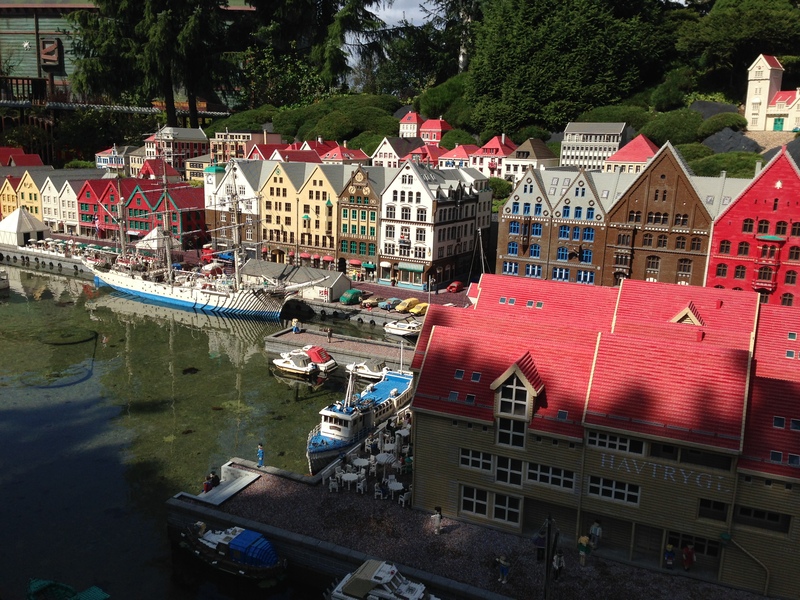 So, when I was told that we would be visiting Legoland on our recent long weekend in Denmark, I tried–without success–to hide how excited I was about going. Yeah, yeah, there was a wedding to attend, and family to see, but Legoland was never far from my mind. For a man without a religion, this felt as close to a once-in-a-lifetime pilgrimage as I could imagine. On second thought, I can think of far worse gods to worship than one based on the happy, colorful, plastic blocks. I wouldn’t think a Lego worshiper would be strapping bombs to his chest, blowing up abortion clinics, or beheading those who choose to play video games instead. We’re builders, not destroyers. On third thought, perhaps I’ll be the one to start this new Lego-based religion. Our church, naturally, will be built out of Lego blocks, and will look amazing. I can’t wait for the tax-exempt status. Where was I? Oh yeah, Legoland, Denmark. There are now six Legolands, with locations in England, Germany, California, Florida, and Malaysia, but the original is where it all started for the company, in the small town of Billund, Denmark. I didn’t know what to expect, and a set about grilling Christine on the subject for what must have seemed like hours. Are there rides? How many Legos are there? Is there a pool full of Lego blocks, where I can dive in and swim around Scrooge McDuck style? The answers to those queries were: yes, millions and millions, and, sadly, no. We ate a late brunch with Christine’s parents and sister, and then the five of us made our way down to Billund. My poor girlfriend had difficulty keeping up with me once we got into the park. I was a ball of energy and excitement, “Look! 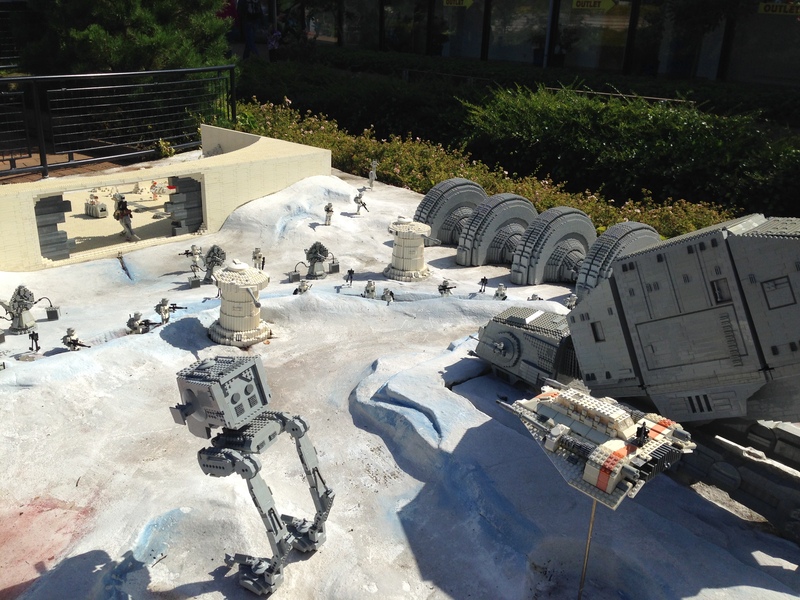 It’s the Battle of Hoth reconstructed with Legos!” “That’s the Kennedy Space Center…in Legos!” “Come! Let’s follow that Lego train all the way around the Lego village!” To her credit, she somehow managed to not be overly annoyed with my chihuahua-like excitement, and took it all in good humor. She even went on the Lego safari with me, which seemed to be intended for five-year-olds. Actually, a great number of the rides seemed to be intended for young children, but that didn’t stop this very old child from trying as many as possible. Although I had no expectations going into the park, it was hard not to be impressed. 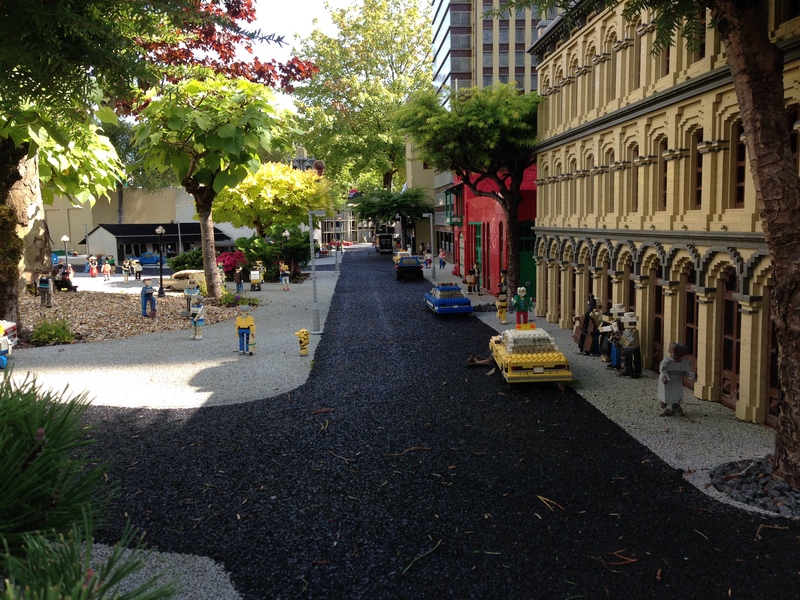 The Lego models were uniformly excellent, and I could have spent a great deal more time exploring each and every building for all the detail and care that was put into the experience. One such display was a mini-Germany, complete with working trains, cars, boats, and even a functioning boat lift. A sign, written in Danish, English, and German (like all of the signs at the park), explained that the display used 2.5 million Lego blocks, and it would take a Master Lego Builder 12 years to complete alone. My first, indeed only, thought was, “How do I become a Master Lego Builder?” Upon further research, you can become by attending the Lego Master Builder Academy. Obviously. After the day was over, I started thinking about the cultural impact of Lego, and why it has become such a global phenomenon over the last sixty or so years. Despite its simplicity, and innumerable imitators, Lego maintains its value, so much so that it is now being targeted for theft by criminals. Sure, strong marketing and sentimental value both play an important role, but I think it is deeper than that. In working with young kids, I’ve noticed our evolution playing out as a child develops. A key moment is when a child goes from destroying, to creating. With Lego, the young child can do both. First ripping apart pieces, and then gradually building more and more complex toys from these simple blocks. And then they can destroy it all and start over again. Of course, there are tons of other creative toys used for building, but Lego seems to be the most dynamic, reliable, sturdy, and fun of all of them, and no subsequent creations have yet been able to replace this ubiquitous toy. Now I just need to convince Christine to allow me to become a Master Builder, and then beg Lego for a job. ← Working to Live, or Living to Work?